Dr. Cynthia Shelby-Lane is a physician, comedienne and motivational speaker. Laughter is the best medicine and her experience and talent are the best prescription for your next event. ShelbyLaneMD is the “Happy Doctor” and she is “just the speaker” your event planner has been looking for. She’s the answer to your program needs and blahs. Get rid of boring and tired. Go for zest and fun. Are you looking for a keynote speaker, lunch and learn, workshops, motivation, a stand-up routine, an online Jam Session, the latest in health care news, or just a break from the routine. Her message and mantra is “laugh more and live longer." Her passion is healing the world through humor and laughter. 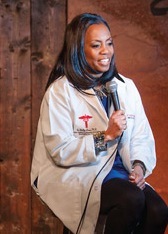 ShelbyLaneMD is a physician, comedienne, entertainer, keynote speaker and workshop leader. Your audience will learn, laugh, cry, and be inspired to change HABITS using the power of laughter and humor. Benefits: learn how laughter helps reduce chronic pain, boost your immune system, reduce heart disease & stress, and boost your “anything in life” . Most of all, learn how to survive those “crisis” situations, at work and at home. Her “Laugh More –Live Longer™” programs are catered for your audiences needs and desires, and most of all, they are engaging and fun. Her speeches are interactive, funny, educational and entertaining. She uniquely blends humor with health and wellness advice for an uplifting message. As an anti-aging and longevity physician, who also trained in comedy, humor and happiness, she is the ideal speaker for your audience. ShelbyLane MD (hero name: Uniqua from the Backyardigans) is a soul searcher for the truth in life. As a doctor, hockey MOM, community activist and comedienne, she connects to everyone and everybody. (Even people she doesn’t want to connect with) Audiences applaud the efforts of every event planner who brings her talents to their venue. She can teach you how to ward off a carjacking, how to unfreeze your toilet in the event of a polar vortex, do CPR at 33,000 feet, and how to get fresh fruit and veggies from the urban farm at Pinky’s Blue house, in the hood. She’s the alternative to the alternative. She often has difficulty getting any respect (being a “female” doctor) so she feels like Rodney Dangerfield in a white coat and a stethoscope. You can learn more about Dr. Shelby-Lane's medical expertise on her personal website at http://shelbylanemd.com/about.shtml. ShelbyLaneMD created her own comedy improv troupe called Girlfriend Village & Company™, and she has the best comedy coaches: Gene Perett (Bob Hope’s Comedy Writer) and Dave Schwensen (Chicago Improv, Cleveland Improv, etc.) and she still performs the comedy circuit, all across the country. Her favorite volunteer and performance venue is the annual Gilda’s Laughfest at The BOB. Her favorite charity is Patch Adams.org and of course, Dr. Adams is her best happy-dance partner. She laughs and dances, a lot, just for the health of it. She’s a doctor by day and a comedian at every stop light, grocery store, school event and hockey arena. She speaks throughout the USA, the planet and the world (even boats) as the Clinical Assistant Professor of Laughology and as a certified and trained happiness master with the Pursuit of Hapiness.org. Her master’s thesis is titled, “Laughter Is the Best Medicine” and she is on the advisory board for LaughMD.com. She’s been seen on CNN (Nancy Grace) ABC (Oprah) and NBC (backstage with Leno and Nicholas Cage) and featured on multiple local TV and radio affiliates, featured in the Aetna African American History Calendar in 2013 for Laughter Therapy (as Ms.April, and has been the winner of multiple media awards for her TV shows and films. Her speaking engagements have featured performances as Teena Turner, Sacha Maria Cubana, Jularene X (Santa’s Ex-wife), Nurse Ratchitt, Elvira & Dracula, and Doctor in the Hood ™. Your audience is guaranteed to laugh, learn and create new strategies for getting a grip on the downside of life. Like most comedians, she also sells stuff (exams) at the back of the room (and online), along with “pictures with the doc”. So, if Obamacare has you confused, stressed and depressed, you need to put a dose of healthy laughter into your next event, (along with her 12 step humor program). www.shelbylaneMD.com is your Rx: prescription. Don’t stress. Get the best. • Brain Health & Longevity: Is Your Memory Fading? Contact Dr. Cynthia Shelby-Lane for information about programs and bookings at 1-800-584-4926. Find out more about Shelby-Lane, MD at http://www.shelbylanemd.com.